No alarm clock set this morning. 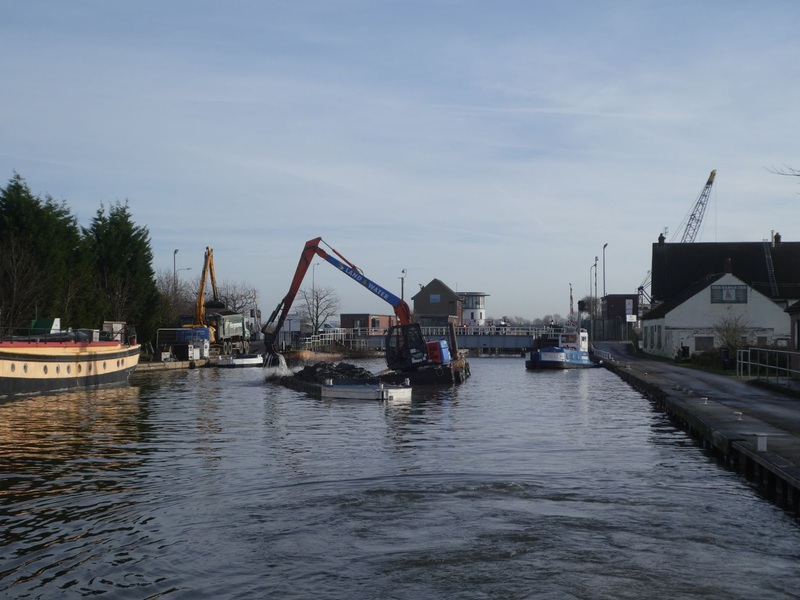 No need as the dredger started to dip its bucket into the canal hoiking out masses of dark grey mud at 7.30am, in the process rocking Oleanna. Not a gentle rocking more a sea sick inducing rock! 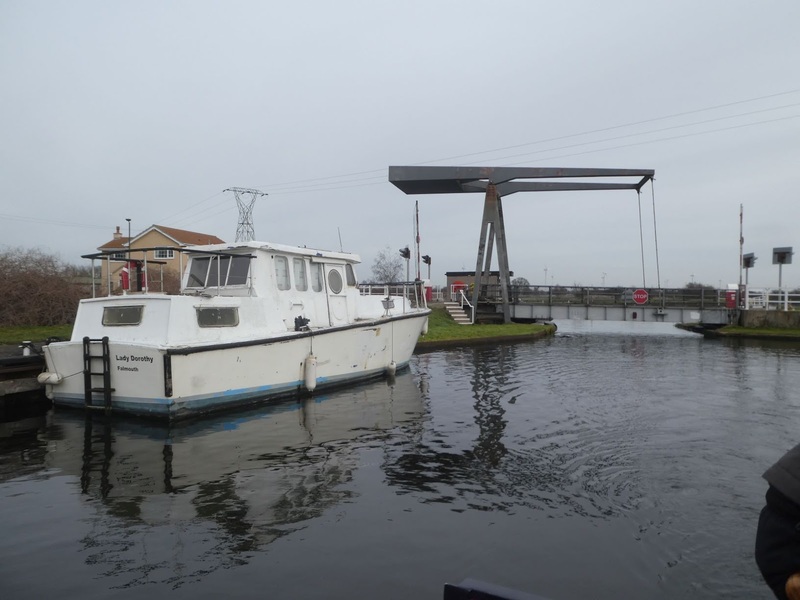 Keadby isn’t the quietest of moorings. The drug dealers and their customers meeting in their cars then zooming back out of the car park (we suspect it’s noisier at weekends), traffic on the swing bridge at the lock and then trains crossing Vazon Sliding Bridge, long goods trains from Immingham that run all night. We’d still managed to get some sleep and had been hoping for a lie in. Mick popped out to see if we’d be able to get to the water point behind us at some point. Once the next lorry turned up the hopper would be moved and there would be space for us. About an hour later there was a loud knocking on our roof. We pulled back topped up with water and emptied the yellow water tank. 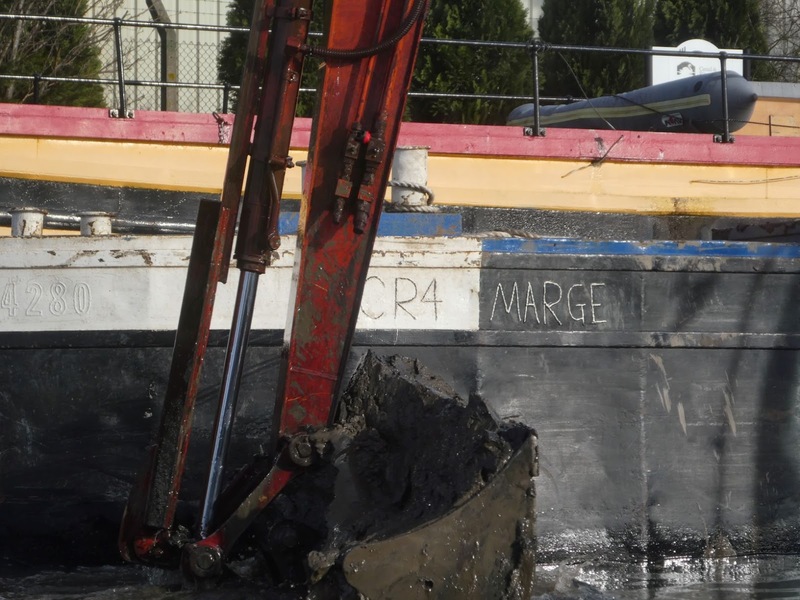 The dredger started again scooping out the mud and dropping it into an empty hopper called Marge. The last time we were here heading towards Yorkshire we’d just come off the Tidal Trent with NB Large Marge, space was limited at the moorings so we’d breasted up Tilly and Jaffa got to know one another through the windows. Once topped up we moved out of the way and made ready to push off, another sunny morning. Approaching Vazon Sliding Bridge we held back as a goods train crossed in front of us. Mick checked his train app to see when the next train was due, would there be enough time for us to get through the bridge or would we be treading water a while longer. Luckily the bridge operator had spotted us, opened his window and we could hear the warning siren start up to warm any pedestrian who might be crossing the rails that were about to slide for us. They slid back on the diagonal opening up the way for us. Mick put Oleanna in gear and we were off getting through as quickly as we could, we knew when the next train was! Now we were on the South Yorkshire Navigation properly. 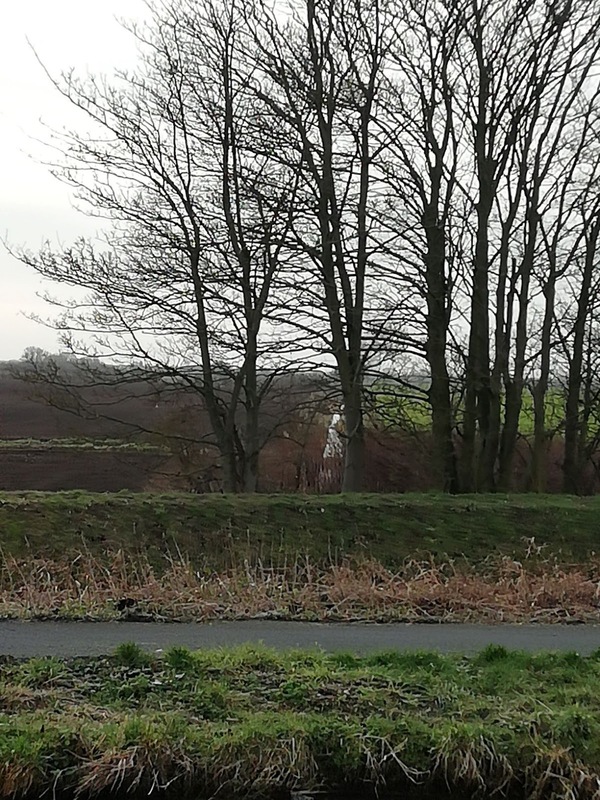 Long straight stretches, views for miles over the low flat land and the low swing bridges, none of them operate the same. I’d made sure of extra fuel at breakfast to have enough umph to get some of these bridges moving. 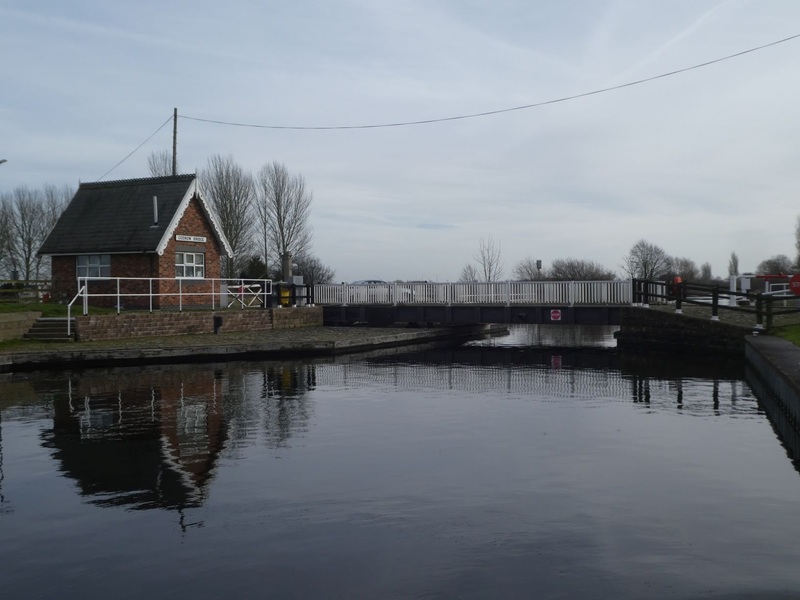 The first one, Godnow Swing Bridge should have been one of the easiest but proved problematical. 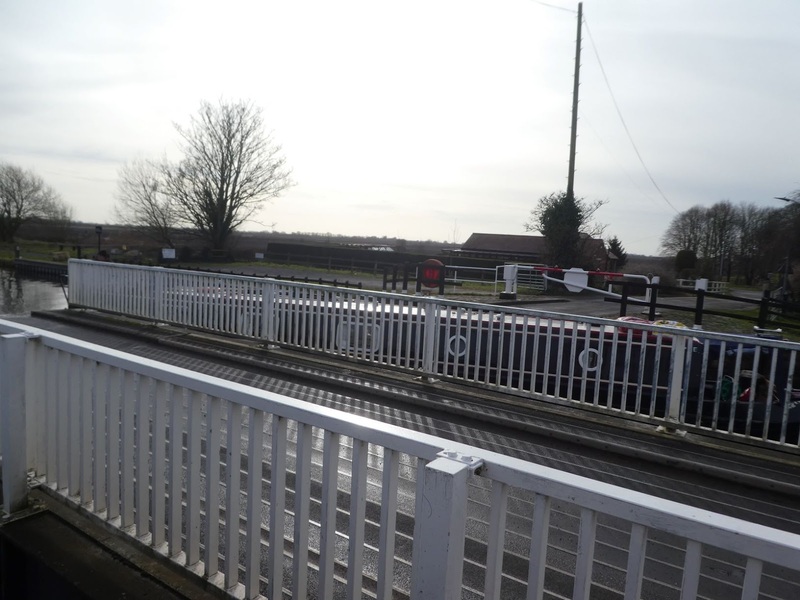 Here the bridge controls are linked to a level crossing on the railway directly next to the bridge. There is a bridge keeper in his little hut, who you have to check with before you can open the bridge for boat traffic. Key of power in the control panel, turn clockwise a quarter turn. This panel talks to you, two letters illuminate to say what to do next. GA, close the gate at the far side to stop traffic. Done. 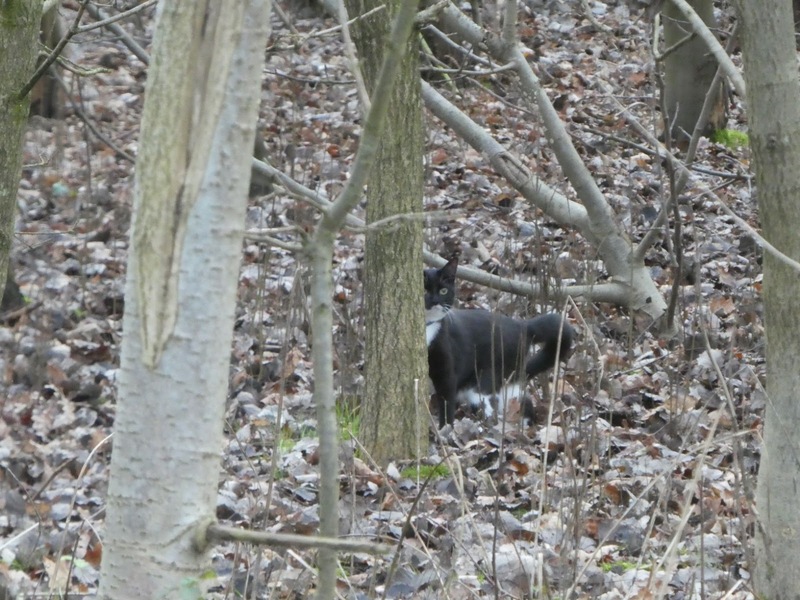 WA, Wait for confirmation from the crossing keeper. Done, his gates were closed. WA, still. WA, still. We tried pressing buttons but still it said WA. Maybe something wasn’t as closed as it should be time to try again. By now there were a couple of vehicles I’d stopped so we let them through. I removed my key, all the time the Crossing man reading out v e r y s l o w l y the instructions, not sure if this was for my benefit or just the speed he read at! Key back in panel, we both (under i n s t r u c t i o n from the keeper, I so wouldn’t have known what to do on my own!) closed our gates and returned to the panel. WA. Mick had joined in by now, still WA. Apparently we were the first boat to go through since the bridge had work done to it. We’d tried everything but still no joy. Time to call C&RT. As I was waiting to get the right option for problems the crossing man spent time in his hut, then all of a sudden OP appeared. I could press the button to open the bridge. It turned out that he had an emergency key or something which he turned and everything started to work again. Maybe an emergency button had been pressed in the cabin during the works, or he’d turned something by accident. Who knows, but we got Oleanna back on the way again, closed the bridge and gates, the man handing me back my keys as if I was about to leave them there! Medge Hall worked as it should, key turn, lift, push, push, kerchung, key back. Then after the next slight bend we could see it, The Border. A dyke to the south marks where Yorkshire starts, the grass very much greener on the other side. As we crossed the border we had a big cheer, back home again. 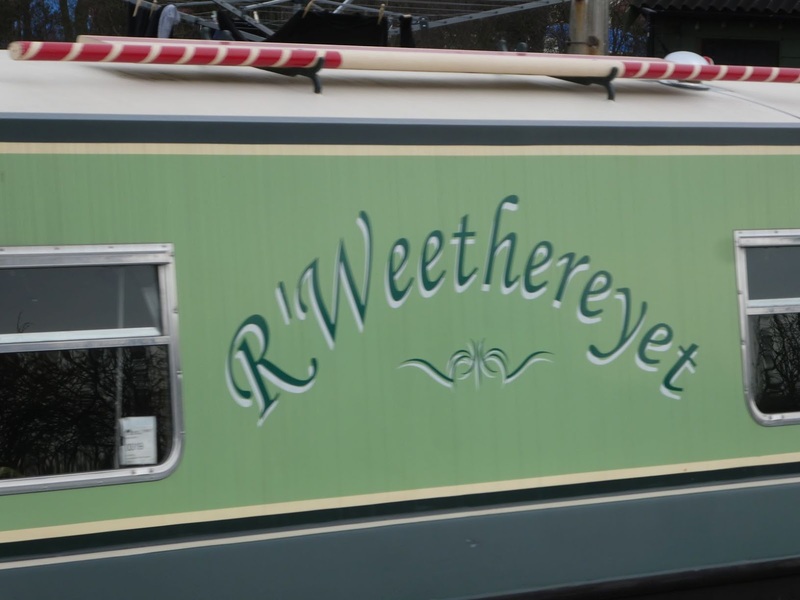 We’ve not been here by boat since picking Oleanna up from Sheffield in 2017. At Moores Swing Bridge I forgot to push the button on the panel to unlock the road gates so increased my steps for the day. At last I managed to hold three cars up whilst Oleanna came through the bridge. 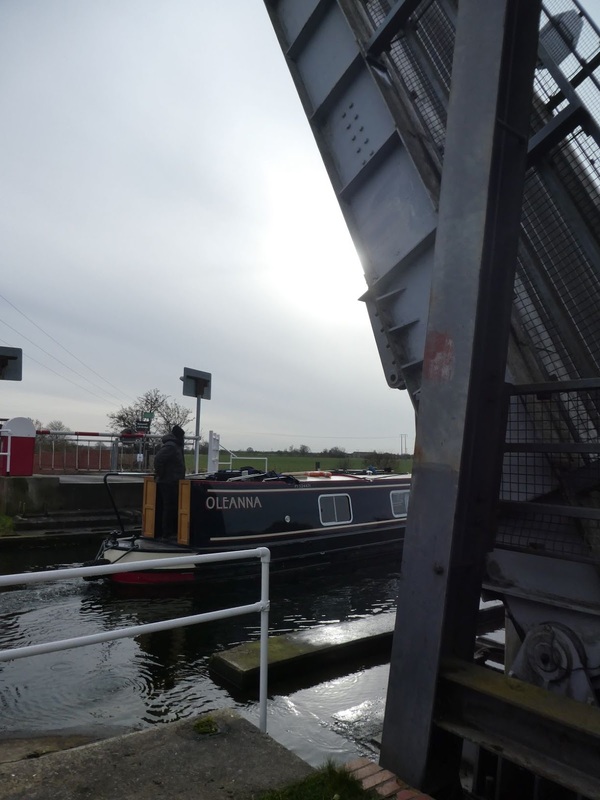 Then Wykewell Lift Bridge rising high to let us through, 1 car, 1 man, 1 dog. Luckily there are bridge landings on both sides of the cut at these bridges. I say luckily because an old cruiser was moored up, chained to the bollards. 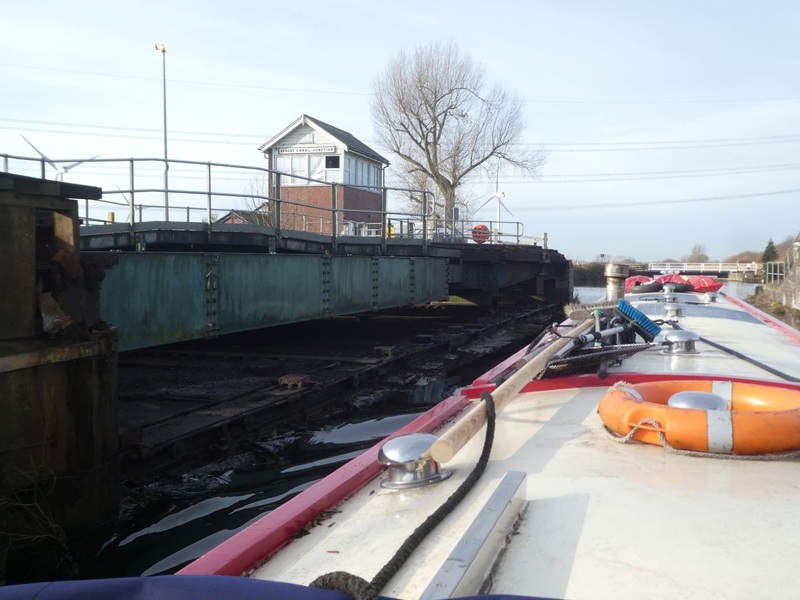 Next Princess Royal Swing Bridge. I hopped off to operate it, keep calm, read the instructions and all will be fine. The barriers on this bridge are renowned to cause problems. The lid to the panel was more securely attached than I remember it being and as I turned the key lights actually lit up! I closed the barriers and made sure they felt like they had located. Pressed the button and the bridge opened. With Oleanna through I then followed the instructions to close the bridge. Press and hold the close button until the Bridge Closed light illuminates. The light came on but the barriers were locked fast, ‘here we go!’ I thought. A lady waiting to cross said I should hold the close button until there was a big ‘clunk’ noise, so following local knowledge I did so. CLUNK. The barriers could be opened. 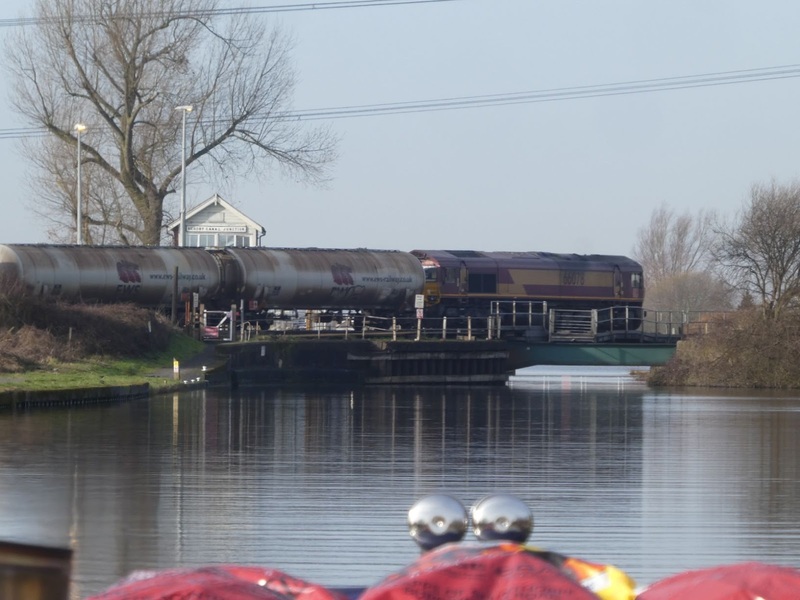 We pulled in just past the services for lunch and to check if we’d be alright pulling up alongside boats outside Thorne Boat Services to fill with diesel. This was fine and at 80p a litre a good price so the tank was full again. The forecast for the next few days is very windy and wet, not suitable cruising weather. We wanted a sheltered spot to sit it out so decided to move up above the lock where some low trees might give us some shelter. As we approached the lock the gates opened, a man in C&RT blue stood in the door of the little lock cabin with a control panel, two other chaps came to take ropes and take photos. They were here to check out the lock. The pound above has dropped by some six seven inches and they were trying to find the reason. 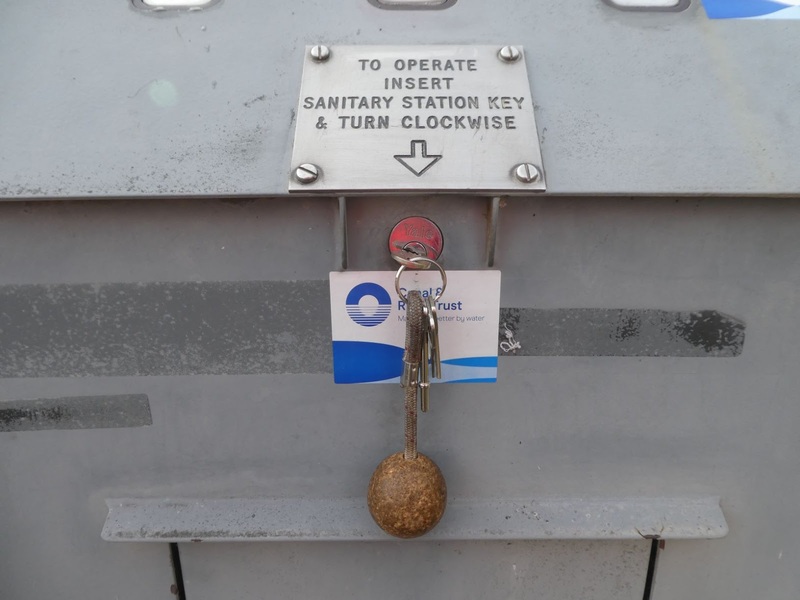 According to the chap in charge, C&RT policy is to leave locks full, safer to fall into than when empty. 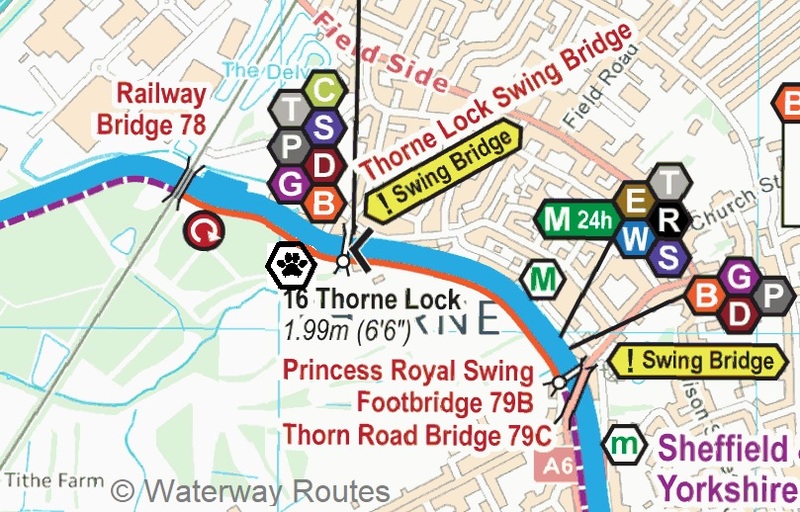 Thorne lock opens a paddle to help keep it full when not in use, however the bottom gates are leaking so the lock rarely gets above 80% full. 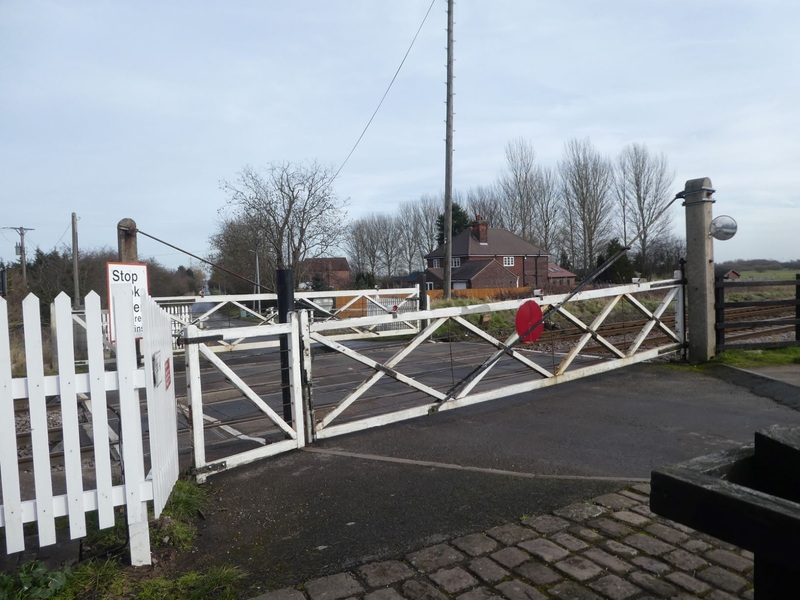 It looks like they will be planning on doing something with the mitred gates to reduce water loss. 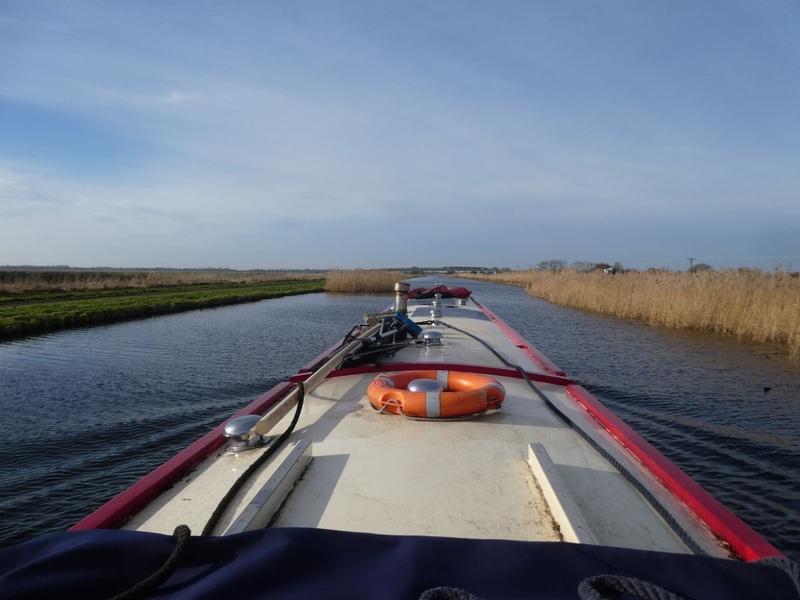 We pulled in and moored across the way from Staniland Marina. A touch noisy with boats being worked on in the dry docks, but hopefully sheltered. Wowwee!!! They say we’ll be in this outside for a few days, Brilliant!!! Paul you have missed an m from your map, but then maybe it’s best other people don’t know about it. Trees, trees and even more trees. Plenty to climb over the next few days. Birdies, a bit of friendly cover and a big patch of grass to graze, once I’ve finished with the trees that is. 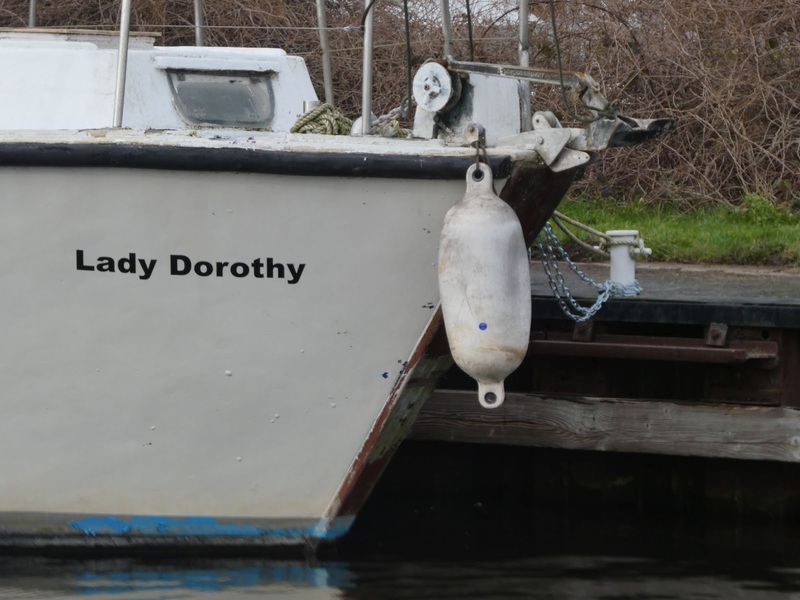 1 lock, 10.23 miles, 1 sliding bridge, 7 swing bridges, 1 lift bridge, 4 cars held up, 1 man, 1 woman, 1 dog, 1 selfish boat, 3 C&RT chaps, 1 Marge, 3 thin patches of ice, 1 cat very happy, 1 Mrs Tilly stamp of approval. This entry was posted in Uncategorized on 8th Feb 2019 by pipandmick. Did you find the chip shop in Keadby?It's about the only good thing there! We remember the noise from those drug dealer cars. It didn't feel like a safe mooring! Naughty-Cal, we didn't go there, but knew of its existence. Is there anywhere we should try in Thorne before we leave?